It is not an insignificant thing to be at the bedside of someone close to death. It’s actually a time when the mystery of life feels so much more obvious; given all that is going on in the body of the person in front of you that life force is still flickering. For some death will come with some sense of release after a long period of suffering; for others it is the terrible end to a swift cascade of misfortune. We don’t know what had caused the Centurion’s slave to reach the point of death, or how long the process had been. What we do know is that he was valued highly by his master, and his master leaves no stone unturned in trying to save his slave. This is in itself unusual: in those days slaves were seen as equivalent in status to livestock. And while there would have been the inevitable financial cost of having to replace the slave, other details about the centurion seem to suggest that his character was such that compassion and care for his slave was the motivation for his request. Some of you may have been invited to join Friends organizations; such as of an opera house or art gallery. Usually, the more you donate, the greater the privileges, which can sometimes include opportunities to meet famous patrons or artists. Cathedrals, despite being part of heritage of this land receive no government funding, and are, in the main, on the large size, without a correspondingly large congregation. As a result, they often follow the same fundraising approaches; so you might find that if you give a large donation it could qualify you for a special dinner with the Dean. The idea that money should buy a special audience with a priest is not exactly congruent with the gospel. But of course it happens: some of those who are seated at the front at every consecration service of every bishop will be those who have given money to churches or causes related to the one being consecrated. 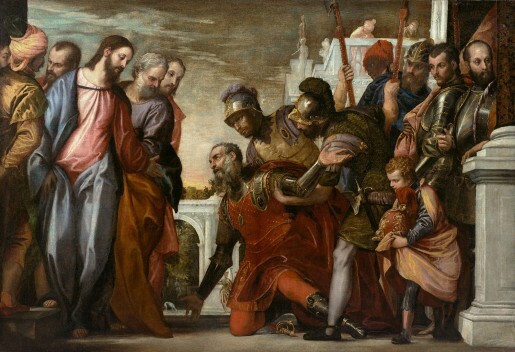 And so it’s actually not at all surprising that the Jewish leaders say that Jesus should go and heal the gentile Centurion’s slave, because he paid for their synagogue to be built, although they do say first that he loves their people. But what is surprising is that the Centurion didn’t remotely think that his good deeds and generosity entitled him to have Jesus come into his house. He didn’t think that after all he’d done for the synagogue he had any special privileges over anyone else. In fact he seems to be saying that, as a Gentile he had clearly less right to have Jesus visit than the Jews he had served so well. One of the parables Jesus told in his ministry was about a man hiring labourers for his vineyard, who went out at different times of the day to find men to work. And at the end of the day he paid everyone the same wages, regardless of how long they’d worked. In telling the parable Jesus anticipates the audience reaction by spelling out that those who had worked hard in the heat of the day were really hacked off about being paid the same as those who’d turned up at the end and worked for an hour. And he says that this is the example of the outrageous generosity of God. But in our world that would be the perfect way to demotivate employees. Why bother to work hard if someone coming hours after you will get exactly the same money? But Jesus was talking about a different sort of model. Whether you’ve had children or not, we have all been children and had some contact with family life. While parents may end up spending more on their children as they get older, I imagine that you’ve never heard any parent say to their four year old ‘because you’re not yet able to do chores around the house we’re going to leave you with Grandma and Grandpa while we go off on holiday. We’re taking your older brother because he’s learnt how to lay the table and do the washing up’. Parental love is not like that, and the parable of the workers in the vineyard indicates that God’s kingdom is not like that either. It’s a place where there is grace and mercy: Mercy being not getting what we deserve, and grace being getting what we don’t deserve. And in either case God’s love doesn’t depend on what we do. The only thing that earns us his love, and puts us right with God is God in Jesus Christ giving himself for us all. Not our learning, not our beliefs and not our good deeds. Only Jesus enables us to be brought into relationship with God the Father. That’s all we need, and it is more than enough, because of who Jesus is: if the creator of the universe, the Lord of all things says this is enough, it’s enough. Now the Centurion certainly got the idea that Jesus was Lord of all, given his response to Jesus’ willingness to come to his house. Only speak the word, and let my servant be healed. And he’s one of the few people to have amazed Jesus by his faith. I expect the Jewish leaders were also amazed at his faith: but if they’d reflected a bit on their own scriptures, they might have been less so. For in them, at the occasion of the dedication of the Temple, the very heart of their faith, Solomon prays that even if someone is not from the tribes of Israel but still faces the temple to pray, that God will answer their prayer in order that all the peoples of the earth would know God’s name. In the New Testament it explains that Christ is the new temple inaugurated by God; the one to whom and through whom we pray to God the Father, the one who enables us to enter the presence of God. It’s possible to build temples or churches that convey something of that eternal truth in stone. But it’s not enough. We must also build our lives in such a way that they reflect the eternal truth of the grace and mercy of God. A God who doesn’t punish us for our sins but who pours out his grace on us regardless of the poverty of our love and service to him. A God who in Jesus has revealed his face of extraordinary love, a God who in Jesus pours out his love to the point of death in order to bring us freedom and peace. We can look at the example of the Centurion, and seek to respond to that love; in generosity and expectant, unentitled faith, bringing Glory to God through lives that reflect some of His grace and Love.